Bali Traditional Tour Sandihi Swara performance Barong dance every Monday. Brong dance is a lion like character in the mythology of Bali. He is the king of the spirits, leader of the hosts of good, and enemy of Rangda, the demon queen and mother of all spirit guarders in the mythological. 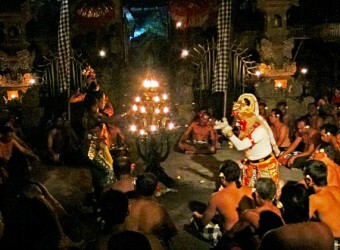 The battle between Barong and Rangda is featured in Barong dance to represent the eternal between good and evil. It was the first time for me to watch Kecak dance. Men sitting in a circle!! The place of dance was lively. I was waiting what will happen after that. No music instrument was played when the show began! It was just the chanting of men`s choir ”cak…cak…cak”.I want to know Ramayana story much more.